After having so many of my friends read and rave about Cassandra Clare’s work, I figured I should probably see what all the fuss was about. Especially since one of her other books (City of Bones) was being made into a movie. You know what happens from there… MOVIE FRANCHISE! Which in other words, means that I need to read the books before I see it on the big screen. Magic is dangerous —but love is more dangerous still. Friendless and hunted, Tessa takes refuge with the Shadowhunters of the London Institute, who swear to find her brother if she will use her power to help them. She soon finds herself fascinated by —and torn between —two best friends: James, whose fragile beauty hides a deadly secret, and blue-eyed Will, whose caustic wit and volatile moods keep everyone in his life at arm's length . . . everyone, that is, but Tessa. As their search draws them deep into the heart of an arcane plot that threatens to destroy the Shadowhunters, Tessa realizes that she may need to choose between saving her brother and helping her new friends save the world. . . . and that love may be the most dangerous magic of all. 1. London Bridges Falling Down. 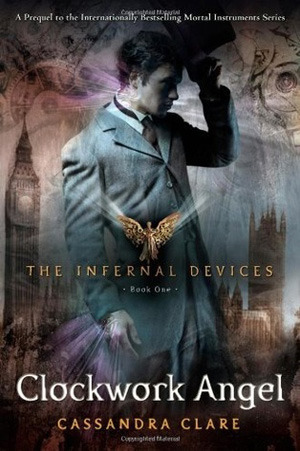 This is Clare’s version of Shadowhunters in nineteenth century London, and can I just say that I absolutely LOVED it! Not only was the setting and time period perfect in that it was fun to be in a different place other than America, it was also well researched. I was impressed by her grasp on the language, for she used words that are not often used in American English. Also, her use of places such as streets like Bond St., Fleet St., and the London Bridge, and Saint Paul’s was clear and accurate. If you have ever been to London before (like me), you might be surprised how well she knows the geography. For those of you who don’t like historical fiction, don’t fear! The way she has written Clockwork Angel almost makes you forget that it’s nineteenth century England. Women’s roles in society is a huge theme in this novel. It is represented through a variety of ways and characters. In the beginning you have Tessa who believes in the conventional roles of a female (i.e. the wife is solely there for trophy purposes and to be there in order to support the patriarchy) much like Jessamine believes as well; however, Jessamine is more aggressive in finding a husband so that she can fulfill this role. On the other side, you have Charlotte. She is young (23 yrs), and she is head of the Institute, which is unheard of. Charlottes role and the fact that she is a woman (not to mention the unconventional roles in her marriage) are questioned and commented upon. The fact that these roles were question is historically accurate to the time period, but can also be applied to todays society, where women are still trying to obtain these freedoms. As for Tessa, she begins as a meek character. One who would happily be at the beck and call of the patriarchy; however, by the end of the novel she adopts Boadicea as her model. She becomes a warrior and a fighter, which made for fantastic character development! 3. Literary quotations? Count me in! This is a fun series for literary snobs. It has both subtle and direct references to a variety of classical work. If you’re a Charles Dickens fanatic, you may just love this book! There are mentions to Dickens, Tennyson, Rossetti, Shakespeare, Spenser, Brontë, Austen, Dante, Horace, Carroll, and Browning. Not to mention there’s a fun subtle Tolstoy reference(/name) hidden in the book too for those of you who read Russian authors. 4. Victorian Poetry for the literature enthusiasts. Each chapter starts off with an excerpt of a poem, or other such pieces of writing. Each piece is important to that specific chapter, which makes it fun to go back and read after you have finished said chapter. To note: Cassandra Clare used poetry from poets whom Tessa would have read, or known minus a few Kipling and Wilde quotations (though they were still Victorian poets, some of their work dated later than 1878). You can read more about this information in the back of the novel in her author’s note. Overall, I thoroughly enjoyed this novel! The characters were fantastic, well-rounded, real, and raw. Each of them had such a variety of specific characteristics, I felt like I could identify them by their dialogue alone. The plot was intriguing and farfetched (but not overly so for paranormal/steampunk(almost)/action novels). It was definitely not slow, and I flew through the book in about two full days. It wasn’t the best novel I had read all year, (which would probably have to go to Sarah J. Maas’ Throne of Glass series), but that is not to say you shouldn’t check this gem out. I look forward to reading and owning all of this series. I gave this novel 4 stars on my Goodreads.